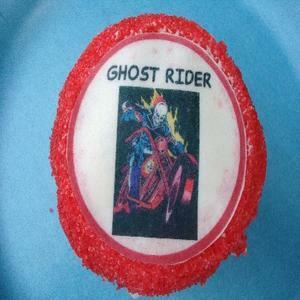 Check out these Ghost Rider Images...they are edible and we put them right on top of a frosted cupcake. We added a little sparkling sugar and look what we made! Anyone who has read about the Marvel comics character Ghost Rider, or seen the movie with Nicholas Cage playing the Rider, will enjoy these fun cupcakes. What a great idea to use these as a dessert at a Ghost Rider fan's birthday party. It's very easy to use these simple cupcake decorating ideas. Make your cupcakes, just like you usually do, it doesn't matter if you use a boxed cake mix or make them from scratch. Frost the cakes and then get ready for easy decorating fun. We used edible cupcake images. They are round images printed with edible ink on edible paper, made out of icing or rice paper. You cut them out and put them right on your cupcakes. We added a little sparkling sugar right along side our edible images to really brighten them up. Here's how you can get some edible images for your next party desserts... Take a look at The Party Works for some great cupcake and cake decorating ideas and supplies. You can also check out Ebay to find lots of edible images for your next cake or cupcake decorating needs.